Buying a used treadmill? Use these five tips to make sure you get the right one! Everyone likes to save money. And buying a used treadmill can be a real money saver. But be careful, or you might end up stuck with a piece of junk that you can’t use and can’t easily lose. A treadmill won’t fit in your trashcan and you’ll likely have to pay (again) to get rid of it if it breaks or runs too poorly. Use these 5 tips to make sure you make a smart purchase. Low end machines are cheap for a reason. Don’t get stuck with someone else’s bad purchase. Make sure you buy a good model from a reputable brand. What treadmill brands are reputable and what models are good? Ask a knowledgeable person at your local gym or do some research online. (But be careful to avoid online sites that get paid for referrals to specific manufacturers.) Consumer Reports likes models from Sole, NordicTrack, Livestrong, Horizon, Precor, Landice, PaceMaster, AFG, Vision, Proform, Gold’s Gym, and Life Span. If in doubt, don’t get snookered by the bells and whistles. As a rule of thumb, look for an electric treadmill with a 1.5 continuous horsepower motor and a good suspension system. That’s what will server you best. If it also has a lot of other features, great. But those are the two most important features. “Upgrading to better model” is a bad answer. “Never used it and need the money” is what you’d like to hear. How often was the treadmill used? Almost never is better than 40 minutes/day. How many people have owned the treadmill? 1 is the best answer. Where was the treadmill kept? Living room or bedroom is better than musty basement that flooded last spring. Some stores like Play It Again Sports will give you a good warranty that includes coming to your home for repairs and maintenance. Do you have service records for the treadmill maintenance? Hopefully this one isn’t a lemon that’s been repaired repeatedly. You’re going to be running on it. So when you go see it, bring your running shoes and take if for a 5 or 10 minute spin. Again, don’t be shy. If there’s a problem, you want to know about it before you write a check and lug the thing home in the truck you had to borrow from your friend. If they don’t want you to try it, then you should be suspicious — leave and buy one from someone else. Pay attention while you are running. Does the suspension feel OK? Do you hear loud sounds or feel shakes? Does the incline work? Do the bells and whistles work? If it has a heart rate monitor, does it work? Take a close look at the entire treadmill. Is anything broken or particularly worn out? Pay special attention to the belt and make sure it’s not frayed or otherwise worn out. Use your common sense. Superficial items like scratches, dings, or a broken cup holder likely don’t matter — especially if you are getting a good price. In fact, you can use cosmetic flaws as a way to negotiate the price down. But if anything important (like the belt) looks damaged, you may want to move on to another seller. No matter how reputable the treadmill manufacturer, an electric treadmill is not going to last forever — especially used treadmills. So try to get one that’s less than 5 years old. But again, use your common sense here. If the owner never used it, it still looks brand new, and it was stored in a good location (not a moldy basement) then a 6 year old model for a great price is likely worth getting. That sure sounds better than a 2 year old used treadmill that was used twice a day by a fitness fanatical couple. Lots of people set ambitious New Year’s resolutions and buy a quality treadmill to burn off their holiday weight gain and finally get in shape. But lots of them give up quickly and end up using their treadmills as clothes racks for their extra clothes. Be patient, hunt around for the right treadmill, and use these tips make a smart purchase. You can save some money and get in shape at the same time. If you stick with it, having a treadmill in your home is really on of the most convenient way to get and stay in shape! 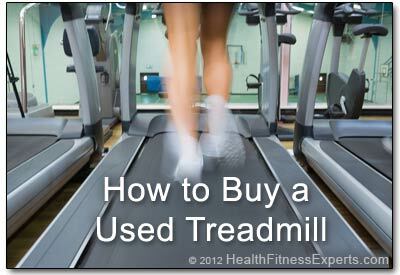 Are you shopping for a used treadmill? Let us know if you have any questions. Have you bought one recently? Share your experience. Leave a comment below! Hey thanks for the useful tips! I just picked up a Precor Elliptical and a Cybex treadmill from a Gold’s Gym that took over a Powerhouse Gym. The seller told me I should have a technician to come and make sure everything’s ok once I set them up, prior to using them. I know it’s silly to ask, but is there any reason I should do that or was she just covering herself as a seller? I used both machines in the gym before I made the purchase. Thank you! Good for you on your purchase! I think that the seller was likely just covering herself, but it’s hard to know with out seeing the machines myself. If you have used the machines and are familiar with them and their setup, then you should be OK. But if you have any doubts or if you are not familiar with setting them up, you may actually want to have someone take a look just to be safe — those are serious machines that could hurt you if they are not set up correctly. Thanks for the tips. I actually just used them to get the most out of my purchase. Really appreciate the information. No problem, Corey. Glad we could help!